As blog followers know, I sold my small business in 2015 and moved to Seattle to start grad school. I rented rooms for my first term, then fell in love with the tiny, tiny apartments in an old, old apartment building near my school, despite the fact that my first google of the apartment name returned this unsettling auto-suggest: Undaunted (I love old buildings, what can I say), I applied. 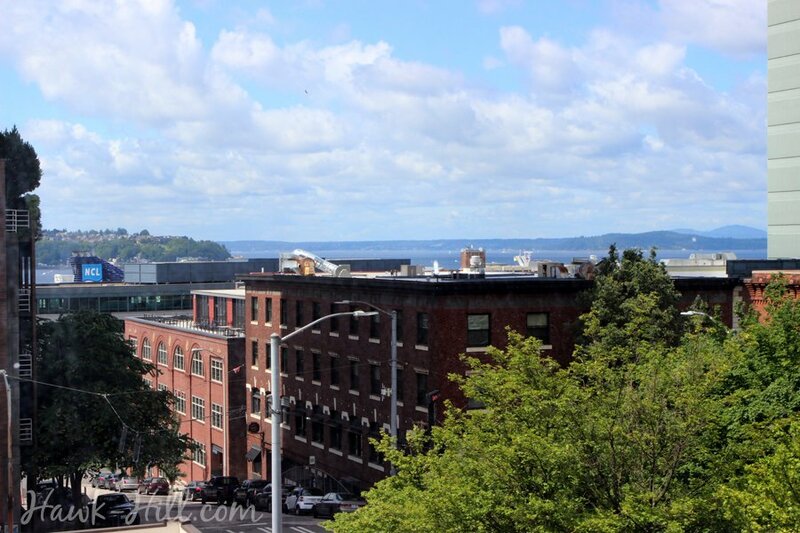 In December I moved into an apartment in this 100 year old building that formerly served as housing for dock workers and was, for several years in the recent past, a featured stop on the Haunted Walking Tour of Seattle. (Yeah, I googled it, apparently there are stories about bodies in murphy beds and a feature on Unsolved Mysteries.) Happy to trade a few ghost stories for high ceilings and solid wood floors instead of the prefab fiberboard-built apartments popping up all over Seattle, The Rivoli has been my home for 8 months and is starting to feel like home. 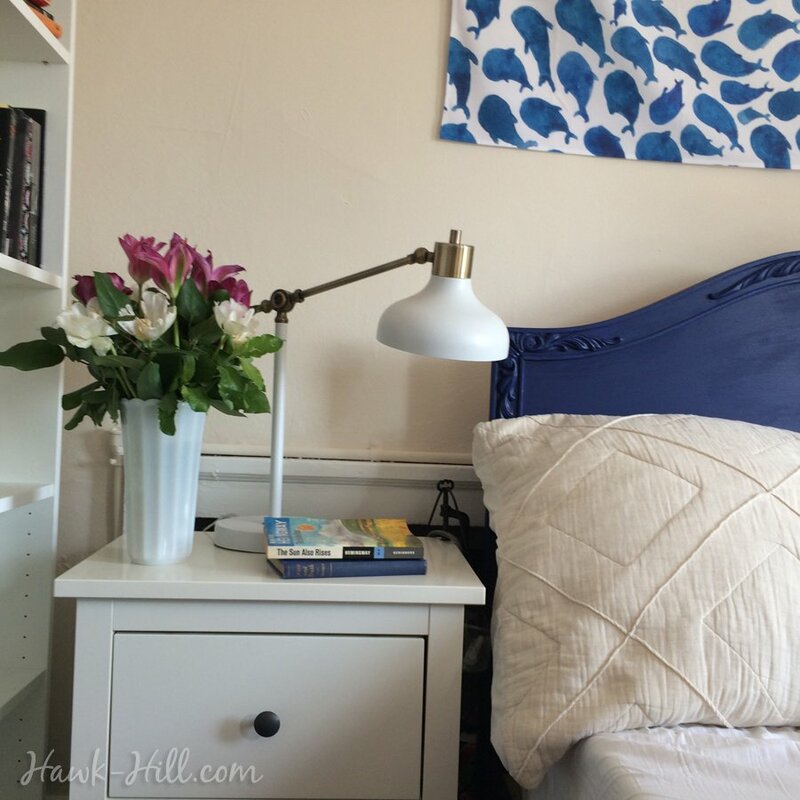 Since showing off decor and projects was such a fun part of maintaining this blog when I lived full time at Hawk Hill, I’d love to take a few minutes to show off my new space and some projects here. 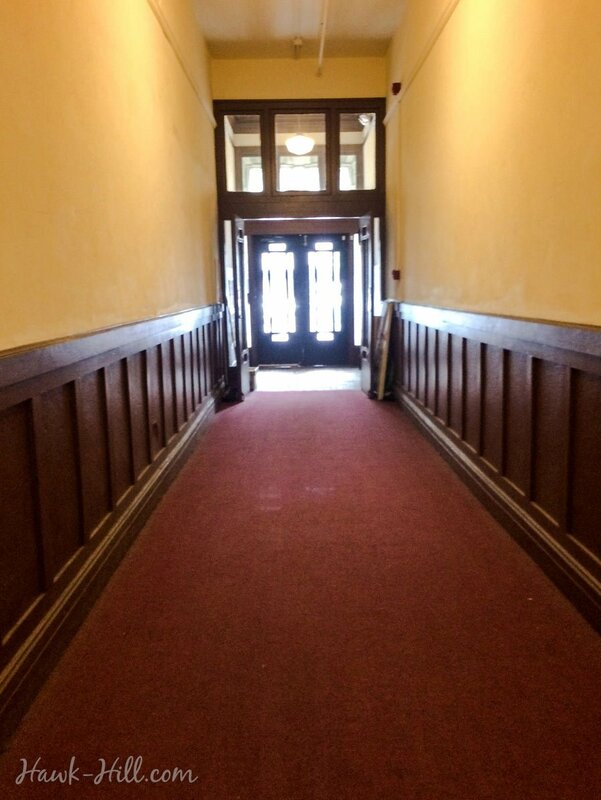 Past the entrance, the building is pretty utilitarian. My friends describe the vibe as “haunted hotel meets college dorm”, and that feels pretty accurate. 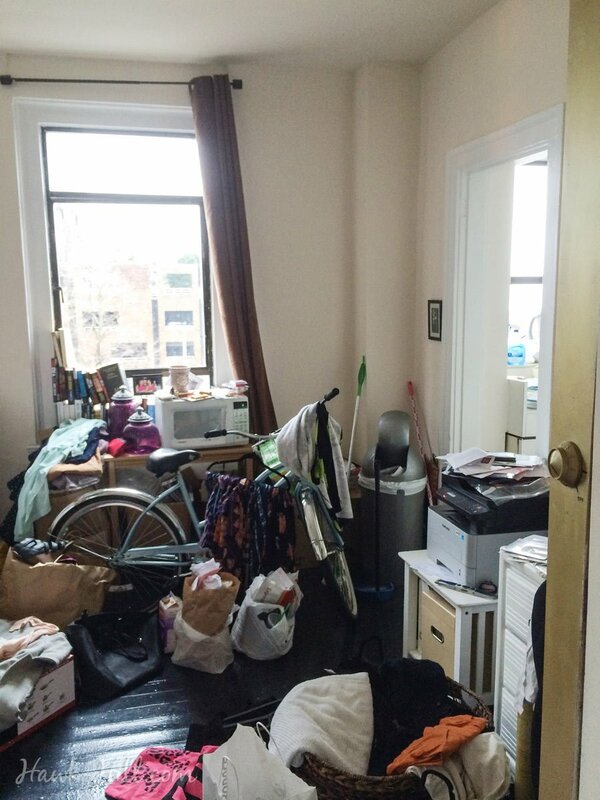 My first look at my apartment wasn’t what I dreamed. But even crawling over someone’s stuff, I knew it was good space. What’s that hole in the floor, you ask? That’s “the bed hole”… the nickname my friend Paul gave to the murphy-bed-inspired space saving design of raising the bathroom floor to allow for storage of a rolling bed underneath. It creeps me out so I don’t use it! Slowly I began to make it home. Of course, flowers helped. A lot. especially in the days in early January where I literally only had a mattress and a cart as furniture! 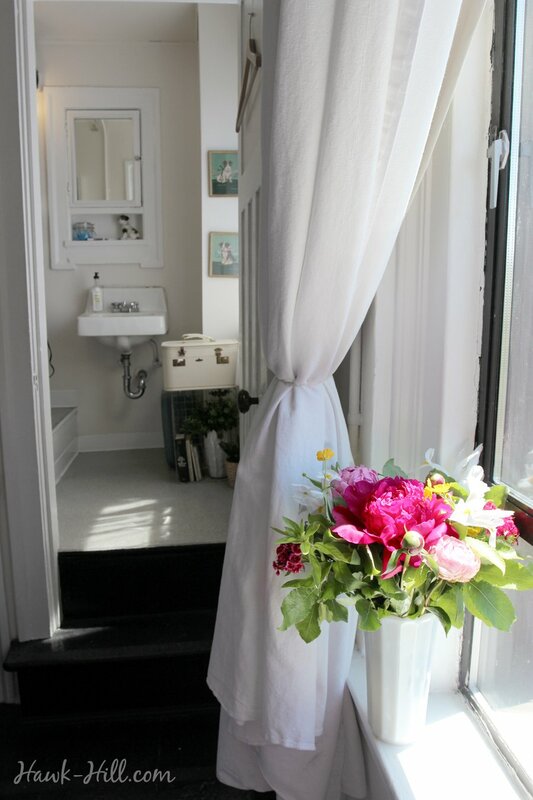 A 6 block walk to Seattle’s Pike Place market means being able to take advantage of very cheap flowers, and as a consolation for living in 280 square feet, I allow myself a bouquet most weeks. Honestly, this view from all my windows still kind of makes me swoon. As a midwestern transplant to Seattle, I’m absolutely in love with the ferries that traverse the Puget Sound. Watching ferries come and go while I make coffee in the morning makes the top 10 list of favorite things about my apartment. The blue smokestack in this photo is a cruise ship- they come and go a few times a week in the summer. So with that as an intro, here’s a tour of what I affectionately call #300sqfeetofawesome. 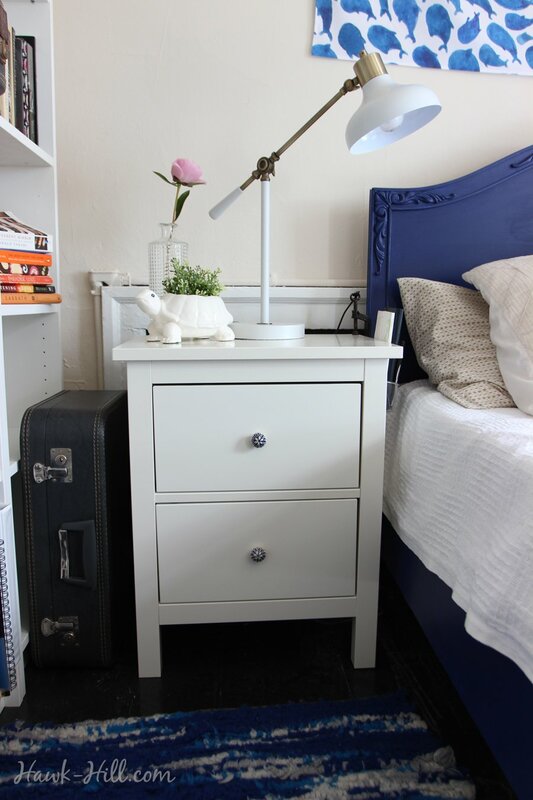 Nightstand and frilly tulips in a vintage vase attempting to distract your eye from the “bed hole” behind. 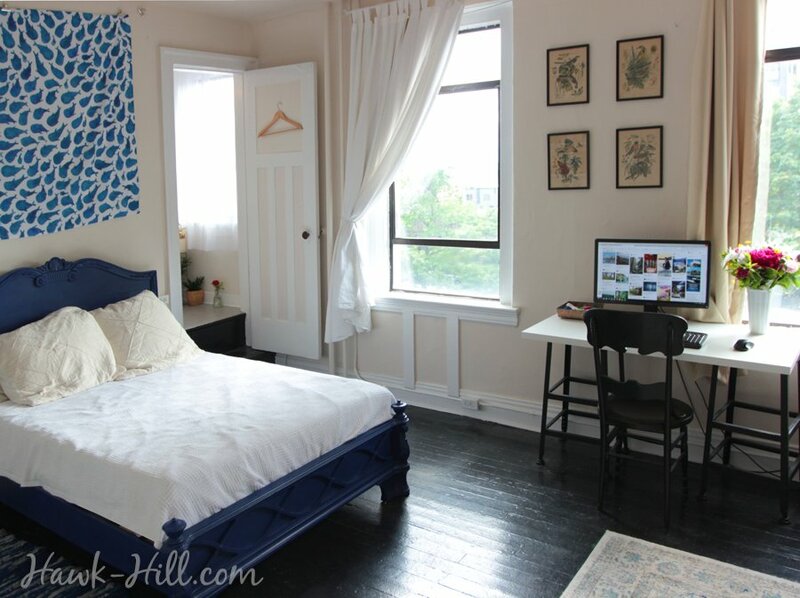 Looking from the kitchen towards the bathroom captures my Ikea Billy Bookcases, Big blue bed, and a whale tapestry. I’d been in enough studios to know to avoid the temptation to wall-off sections with partitions or bookshelves. 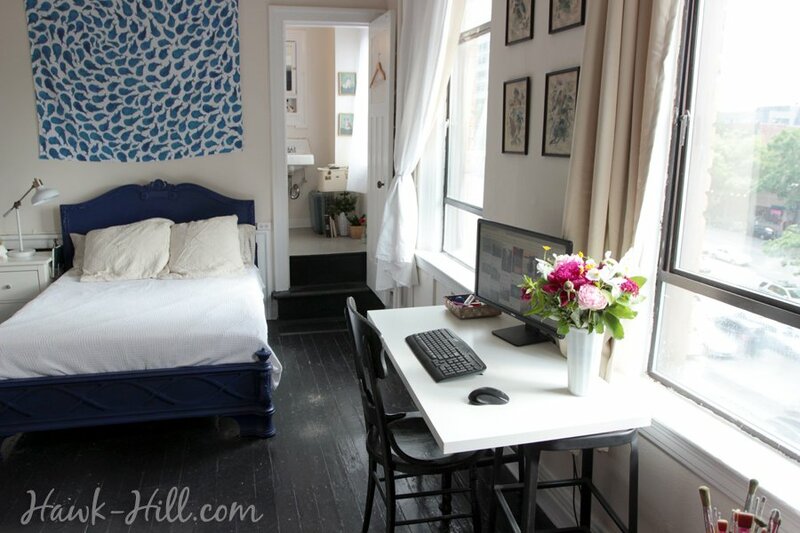 I knew rather than sectioning the tiny studio apartment I wanted to focus on making a big statement in a small space, and a good way to do that would be to invest in one fancy statement piece of furniture. 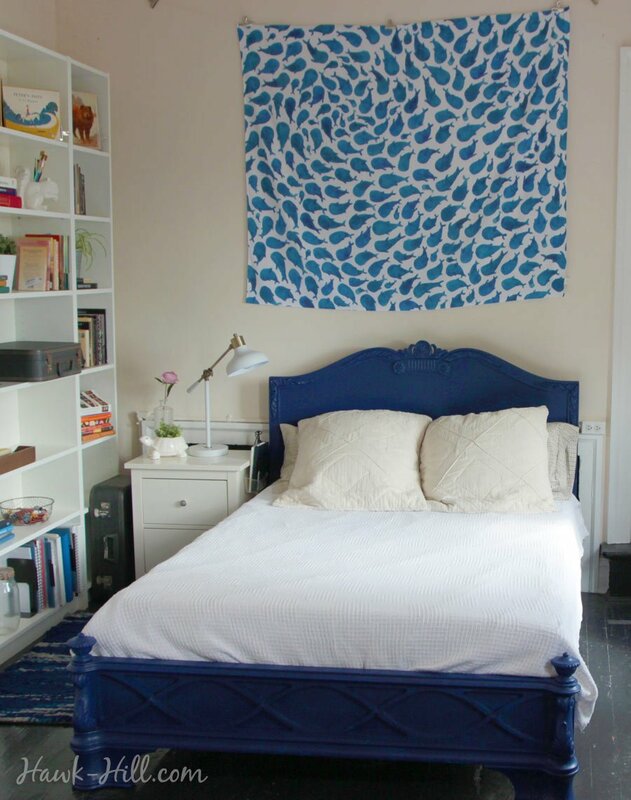 Enter: my Big Blue Bed. 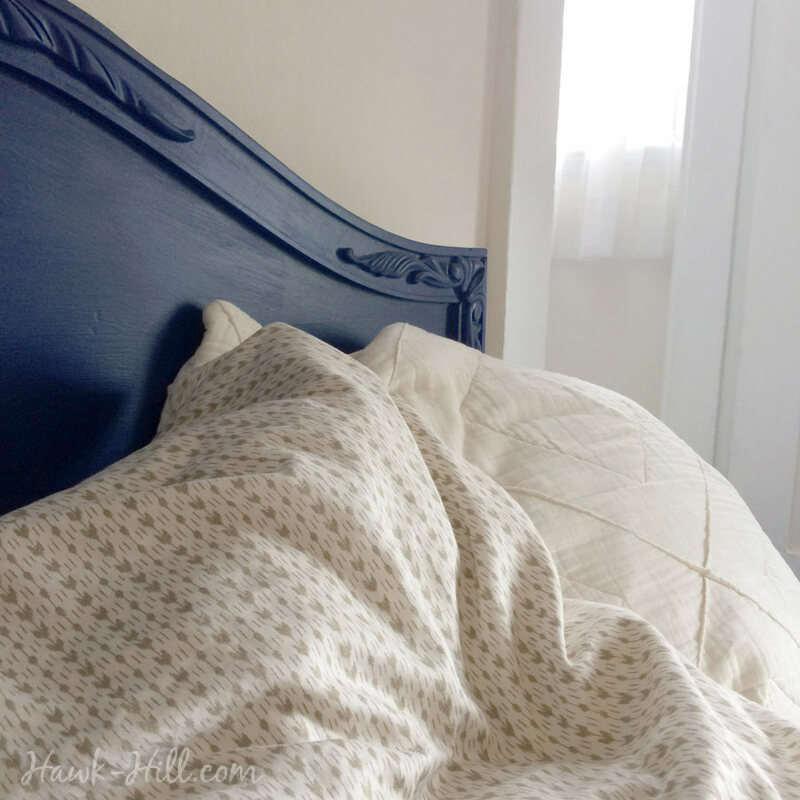 I scoped Seattle Craigslist for about two weeks before I found a couple selling a this ornate wood bed, natural-wood colored stain and smelling faintly of cat pee, for $150. 1 wash with vinegar, 2 coats of Zinzer 123 Bullseye primer (to get full adhesion of paint to the slick lacquer that was protecting the wood stain), and literally 5 or 6 coats of Benjamin Moore “Admiral Blue” and I had the big statement piece I was dreaming of. 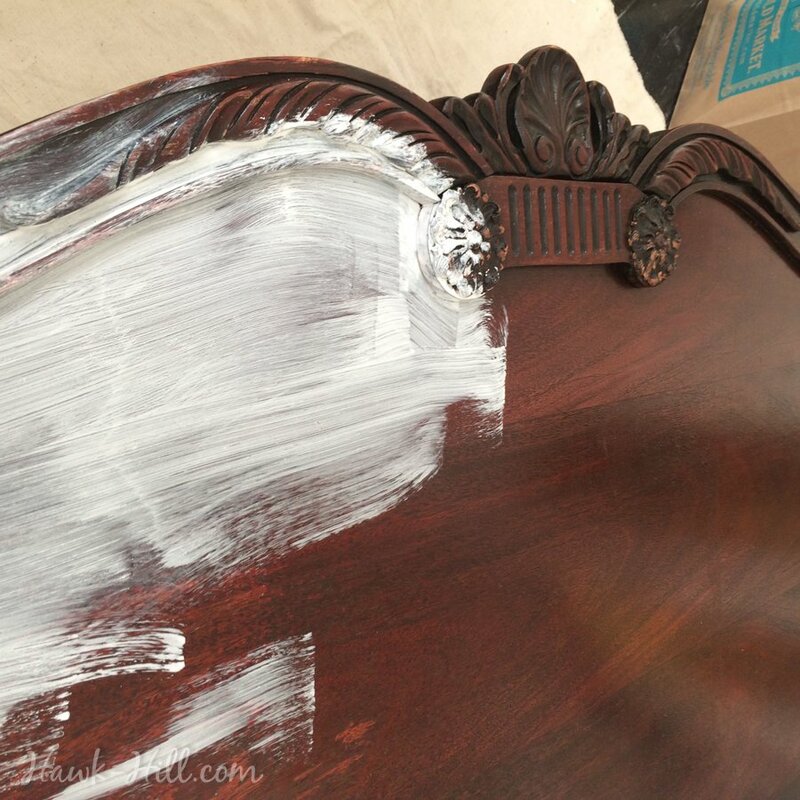 Ornate vintage headboard getting first coat of primer. 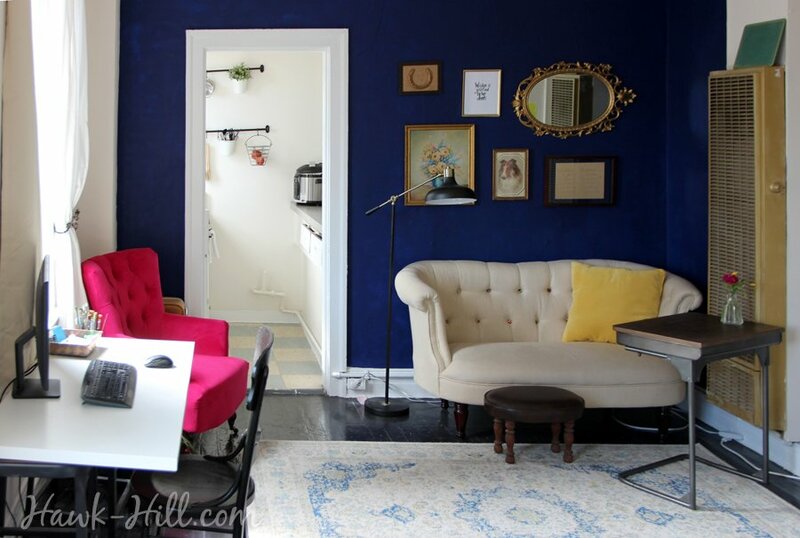 With the manager’s permission, I painted the opposing wall in matching Benjamin Moore Admiral Blue to build a color theme. 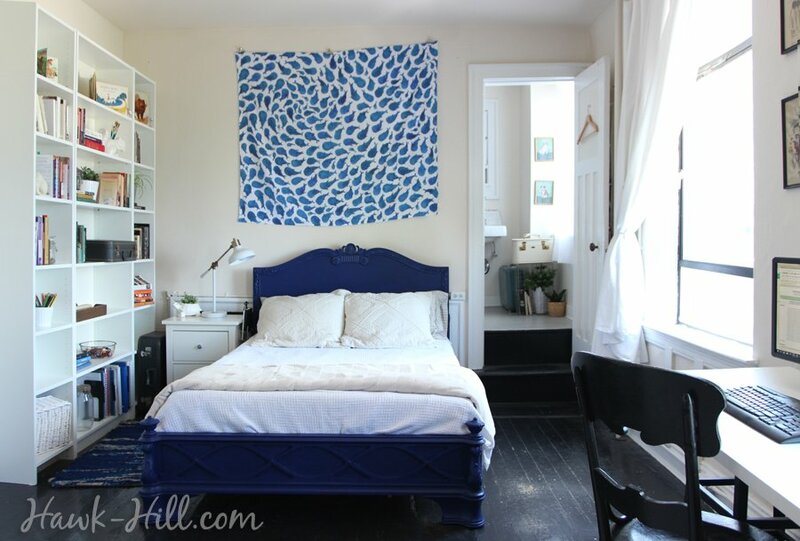 The large blue bed opposite the blue statement wall works really well, I think, to make the small studio feel balanced color-wise. The “living room side” of my apartment. The gallery wall features, clockwise from top left: 1. a horse shoe from my first horse, painted antique gold & mounted on burlap & framed. 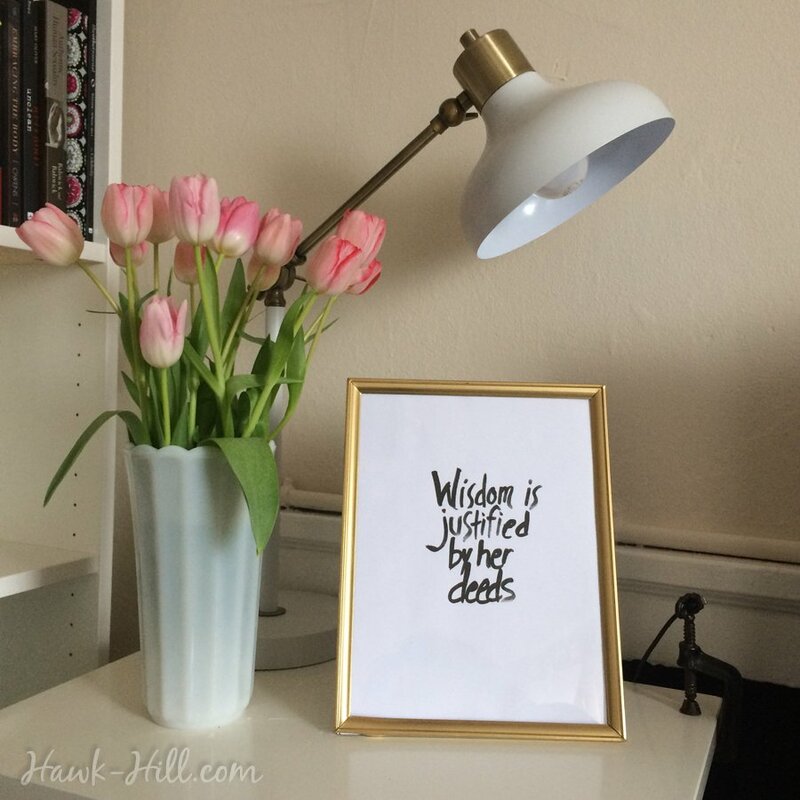 2. a hand-lettered painting of Matthew 11:19. 3. Thrift store mirror. 4. A framed page my mother saved from kindergarten showing a my handwriting as I learned to practice writing my name. I cherish this piece because it reminds me that really hard things can become really easy when you keep practicing. 5. Thrift store dog print. 6. An original painting I absolutely adore, that I scored for $2 at an antique shop once. 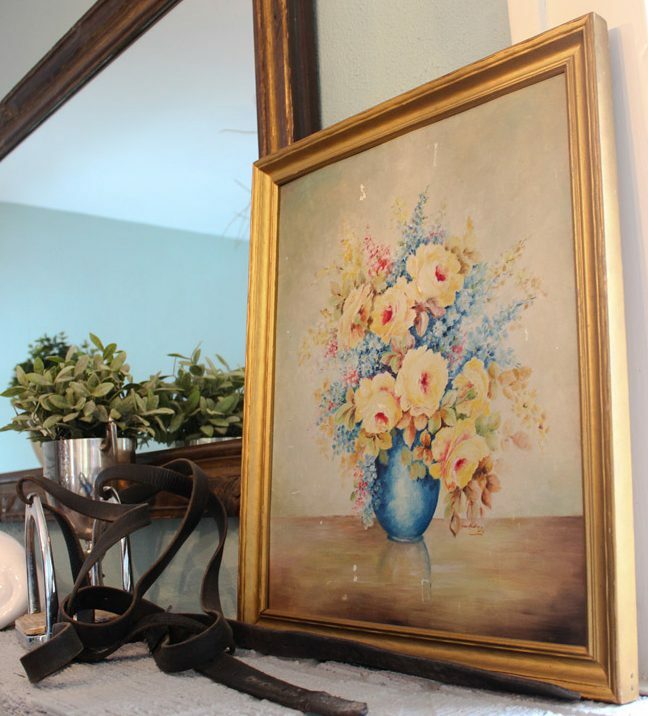 My favorite painting – a $2 flea market find – in it’s old home on my mantle in Missouri. 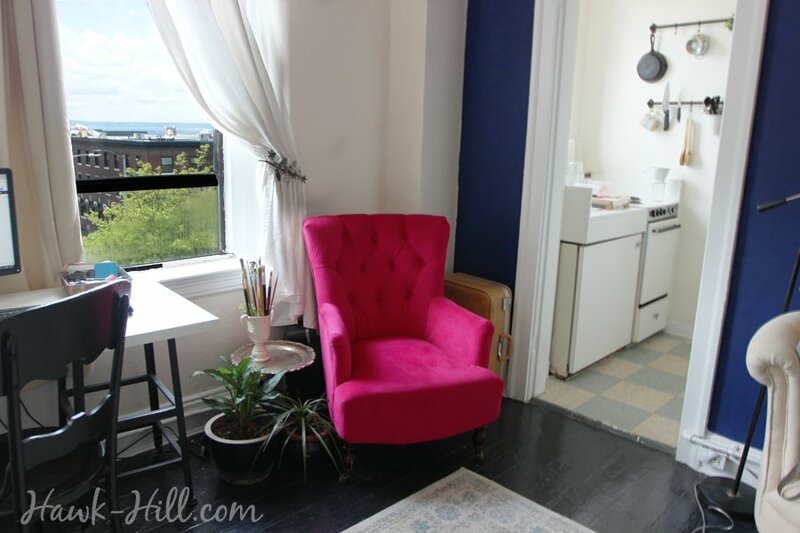 The kitchen is tiny and cute, though less than charming to cook in. I cannot imagine what it’s like cooking for more than one or, God forbid, WITH more than one in this kitchen. The pull out cutting board and cabinets that reach to the ceiling help a little with space issues, though. 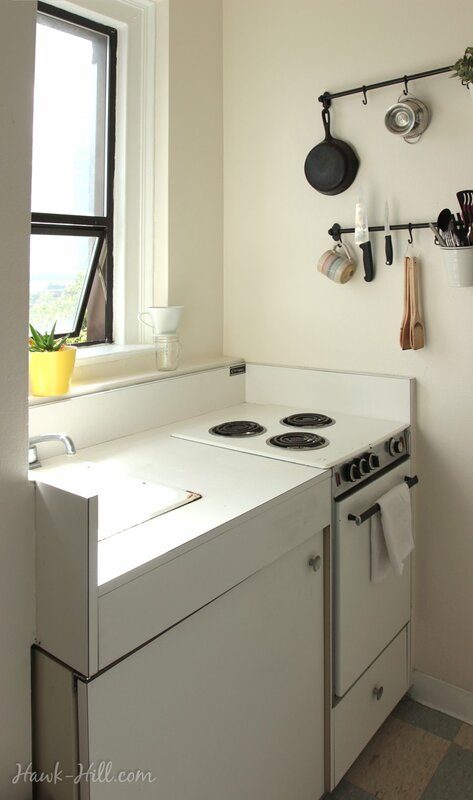 The kitchen of my studio apartment was literally designed and built by a company that makes boat galleys- extra, extra, extra small! My sink is literally about the size of an average shoebox. 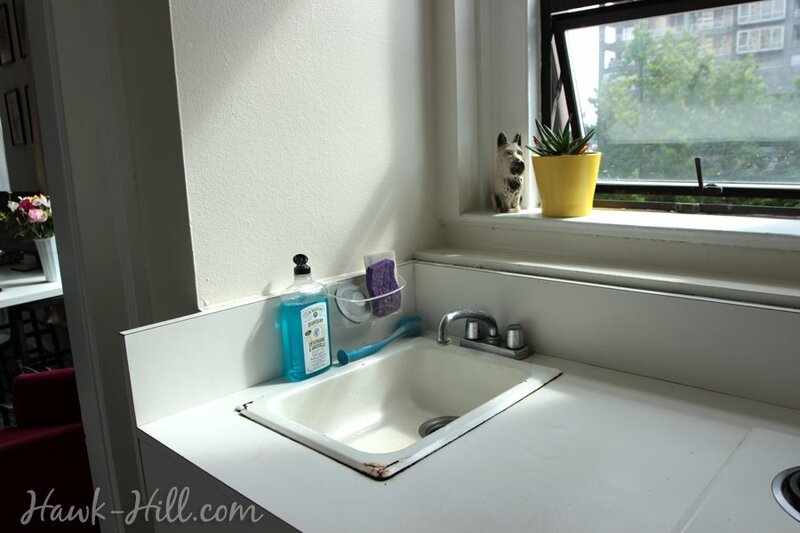 I’m just thankful I have a separate kitchen and bathroom sink, because many of the tiny studio apartments I looked at in Seattle have one sink shared by both bathroom and kitchen. 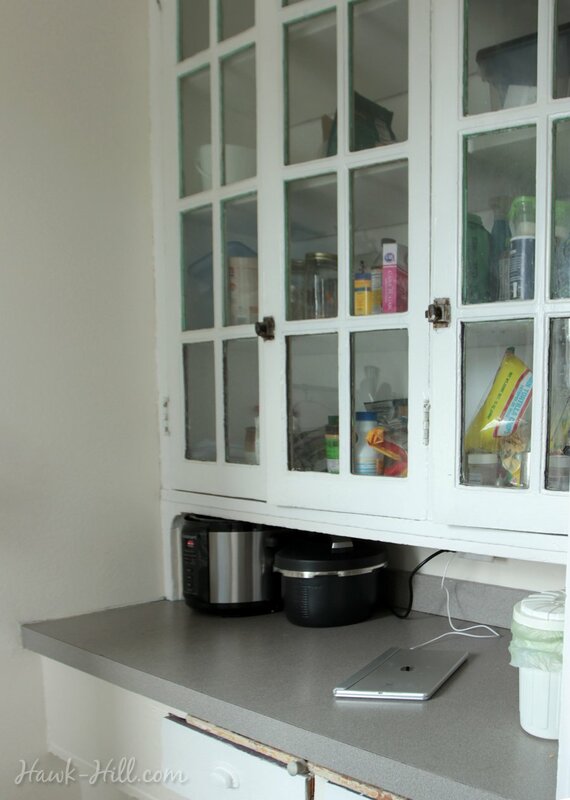 You can see my kitchen has room for literally ONE appliance and I chose an electronic pressure cooker. Strange choice? Maybe, but I love this thing- and think I will probably do a blog post on it soon. An electronic pressure cooker can be used like a super-fast crock pot, but can basically do anything a pot on the stove can do: I make scrambled eggs, homemade chai tea, grilled cheese, even pasta in my pressure cooker on various settings. Here’s the one I had in MO and actually had shipped from MO to myself in Seattle. It’s a little easier to navigate and clean than pots and skillets in my tiny kitchen, and feels a little safer in terms of navigating heat in a kitchen where it’s really easy to get too close to a hot pan or burner. A sunny windowsill with flowers from Pike Market. The vintage train case in the background looks like decoration, but set up on a crate, I use it like it would have originally been used: to hold my cosmetics and some jewelry. One of my best tips for tiny living: Identify things you MUST have but don’t want to look at regularly (For me: microwave, printer, toolbox, etc.) and making hiding them a priority. 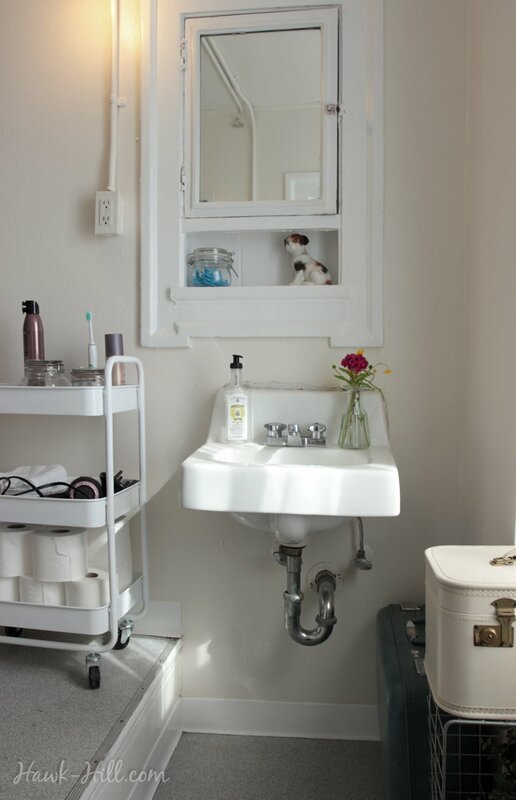 I chose to hang clothes on wood hangers in an open area of my entry hallway, and instead to use the closet for a shelving unit that stored utilitarian ugly necessities. For other uglies that I need access to daily: contact lenses, mouthwash, hair gel, etc, I keep my eye out at thrift stores for vintage liquor decanters, lotion/soap dispensers (which work great for hair gel), and wide bail-top jars. 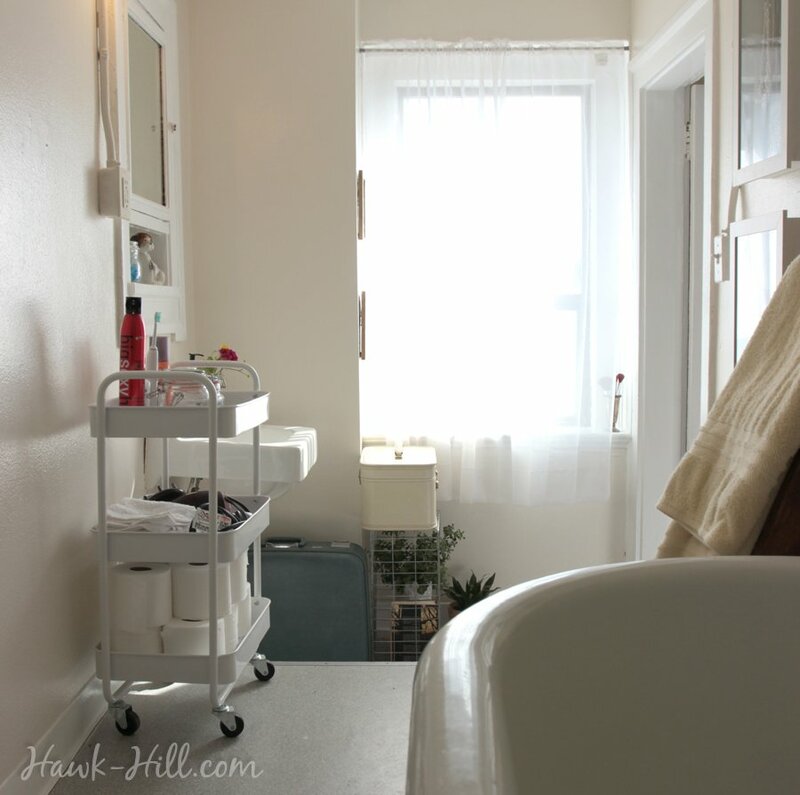 My bathroom, and the rolling cart where I hide some of my daily necessities in plain site in vintage jars. The blue suitcase under the sink serves a dual purpose of storing some art supplies while also covering a previous tenant’s hot pink nail polish stain on the floor. the shadow boxes mounted on the wall of my bathroom actually display/store my necklaces. This ceramic dog, “Bainbridge Dog” was the very first thing I bought FOR my Seattle apartment, during a trip to Bainbridge Island in the fall. 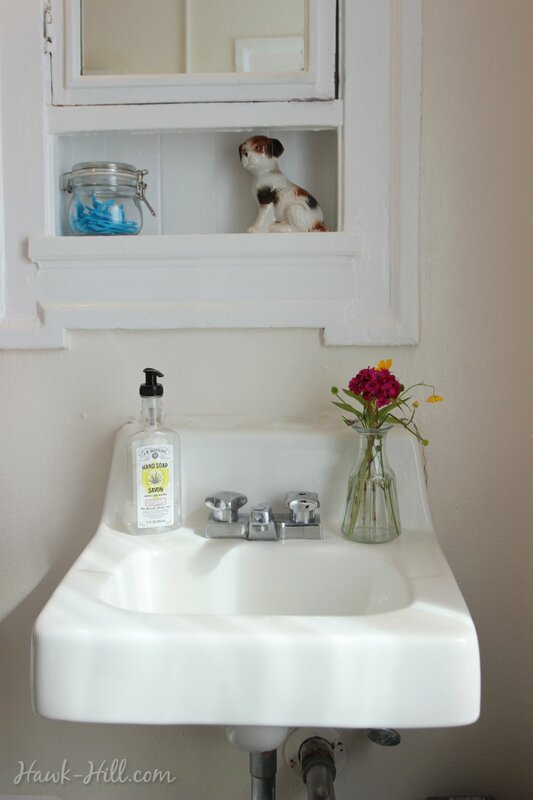 When I get a bouquet from Pike Place market, I always try to pull out a few of the filler flowers to create a tiny floral arrangement in the bathroom. 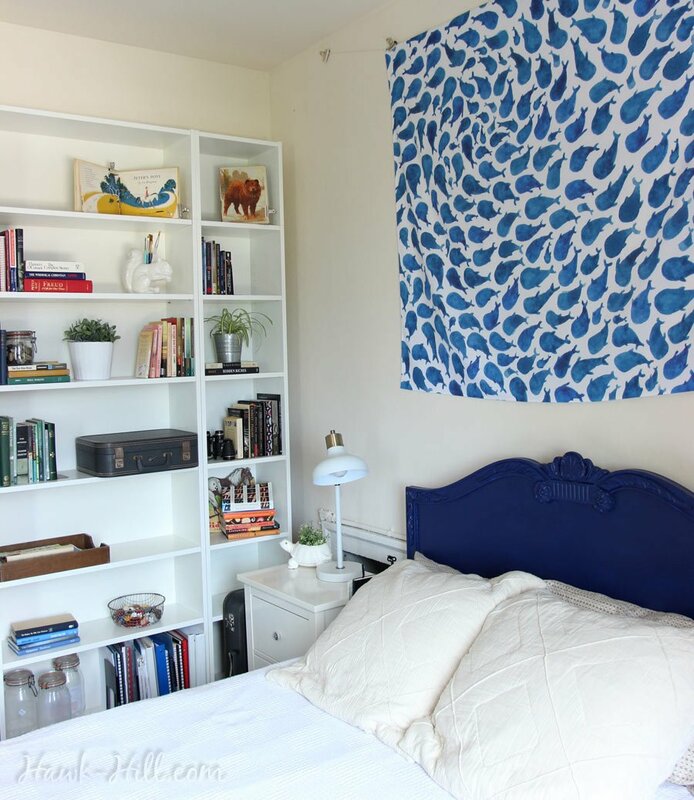 I’m finding wall tapestries to be a great renter-friendly way to fill a wall or make a big statement. 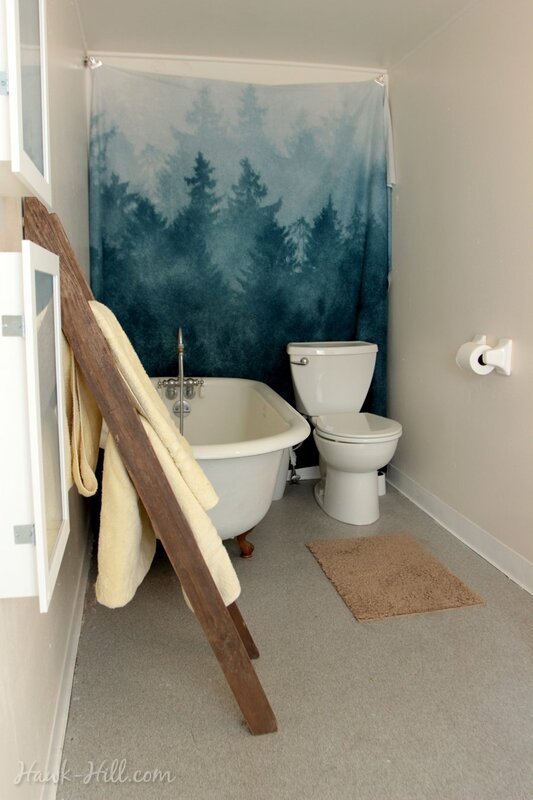 I think this wall tapestry helps the ‘taupe tunnel’ feeling my long, narrow bathroom had before hanging it. 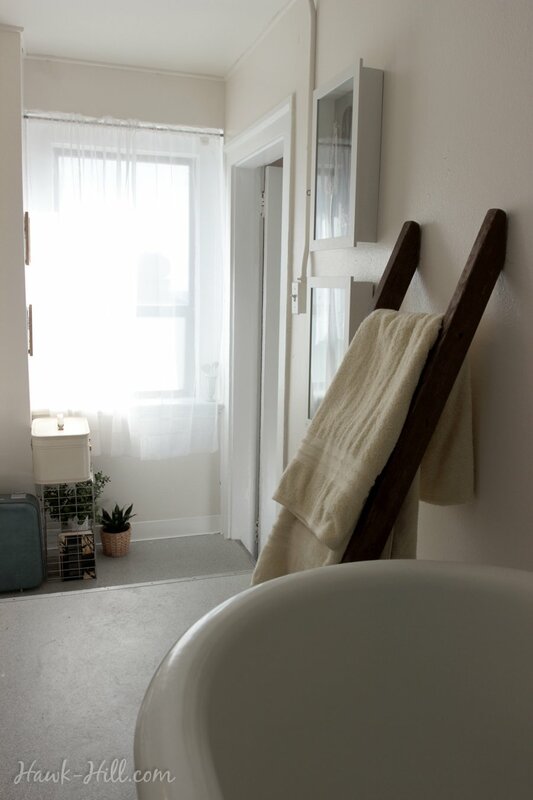 The towel rack in my bathroom is a short vintage ladder I scored from a curbside trash pile one day in Renton, Washington. Another view of bed and workspace. I know most people would probably cut back to a laptop in this space, but I love the huge screen when I’m editing photos and even for writing papers. 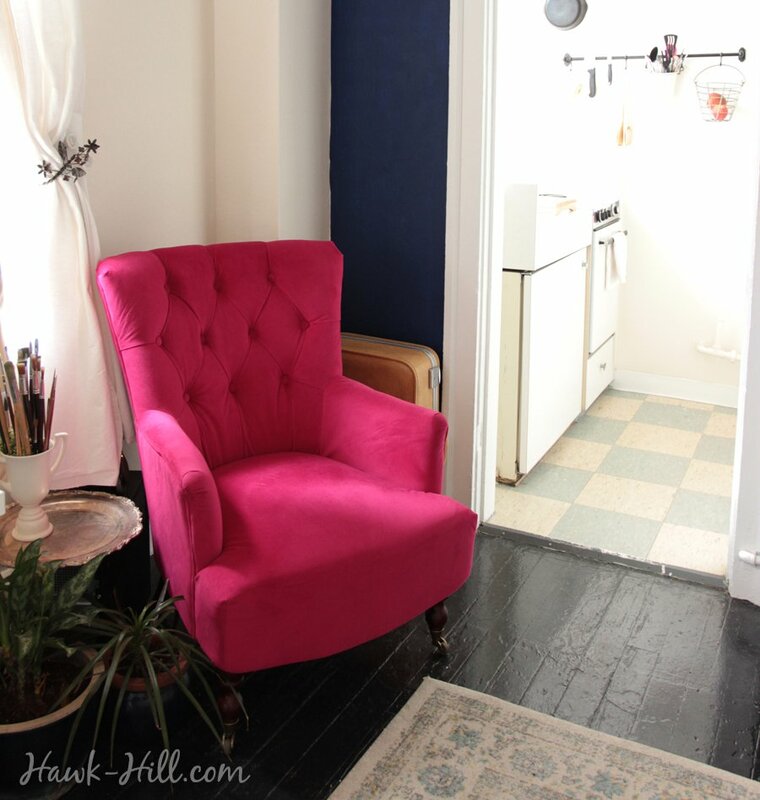 I love my bright fuchsia ‘Nina’ armchair from World Market. Unfortunately I haven’t got to sit in it much, as I broke my tailbone this spring and it’s especially uncomfortable right now. More of my living space. I’ve sold and replaced this rug since this photo. Turns out that even in a tiny apartment I always underestimate how big of a rug I need for a space! 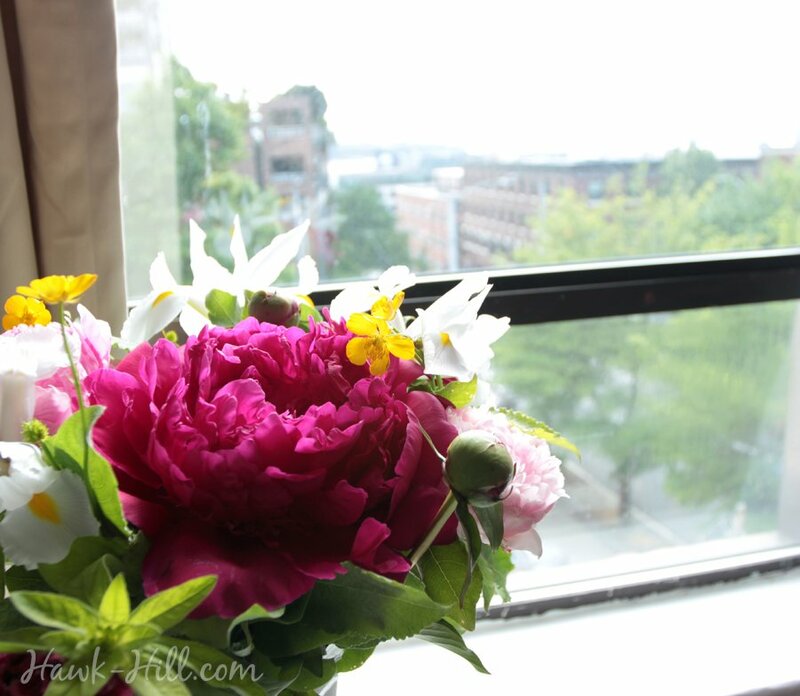 It was a happy day this spring when peonies arrived at Pike Place Market! This turtle came with me from MO. 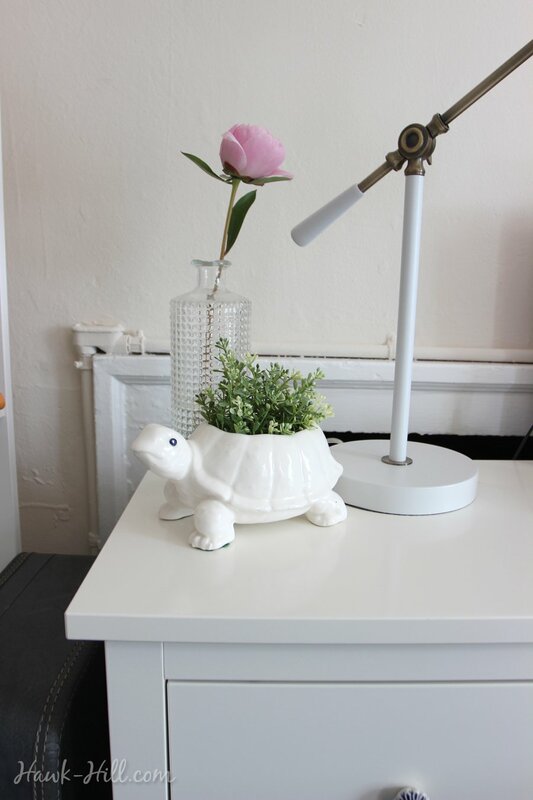 I made a tutorial for hacking $4 Ikea greenery to fit in little planters like this a few years back. I’ve started a suitcase collection since I moved to Seattle. I use them like I would a plastic storage tote (but so much cuter!) and, bought second hand, they typically cost about the same or less than a similar sized storage container. That view!! My window faces west and watching the sun set over the Puget Sound is definitely something I appreciate. 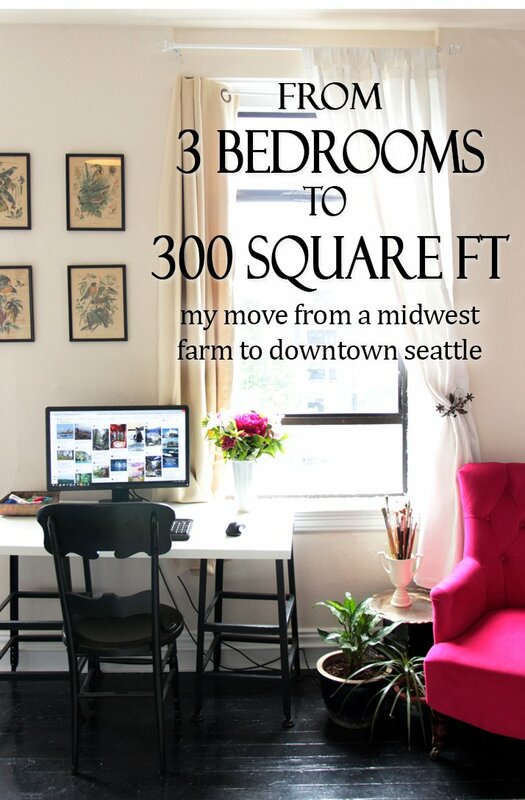 How I made the leap from a 3,000 sq foot farmhouse to a 300 sq foot studio apartment in downtown Seattle. Oh my god your apartment is so beautiful and impressive you are quite the artist and you have incredible design skills. I’m envious of your talent. 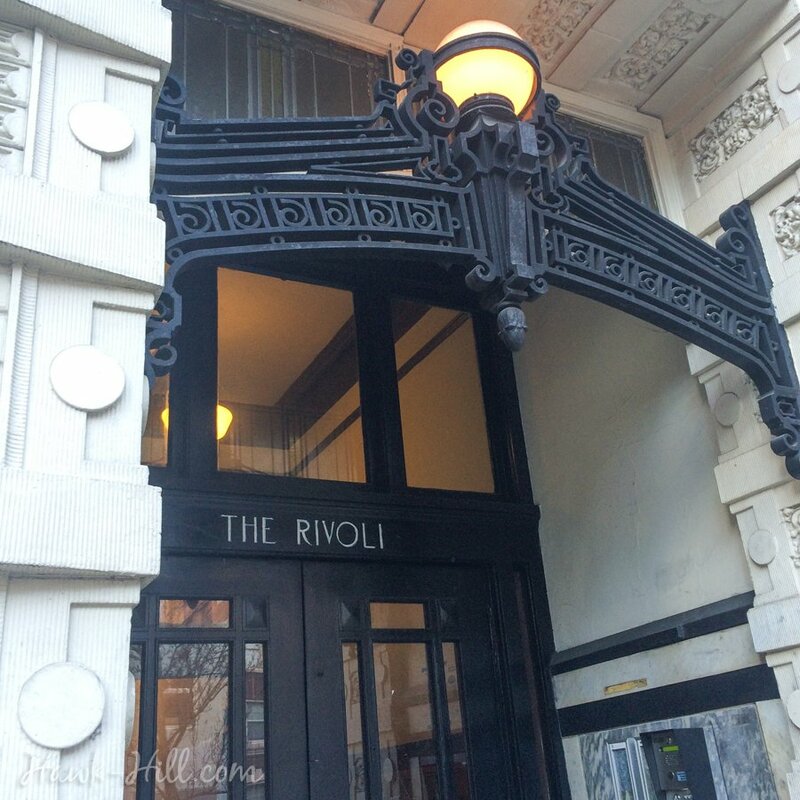 I came across your article reviewing info about the Rivoli. 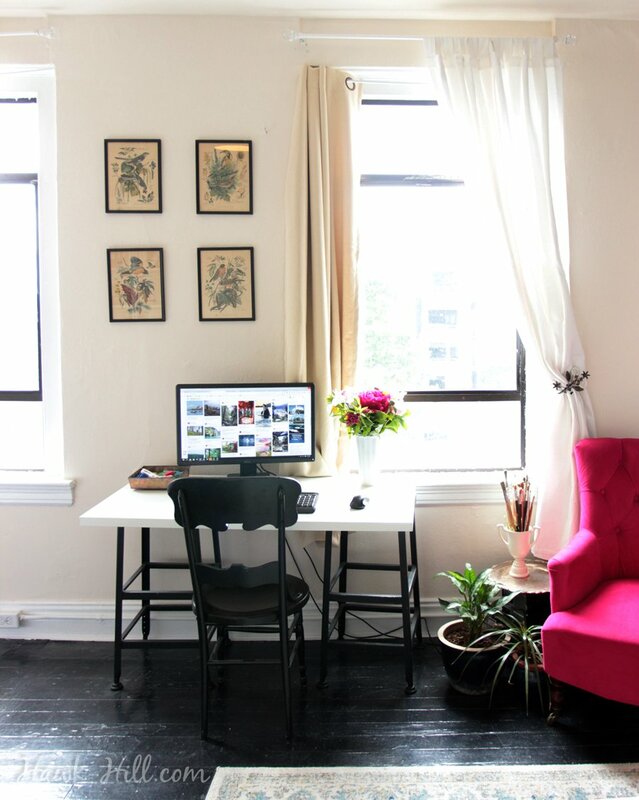 I’ll be shopping for a new place soon and moved out of a 150 sq ft space in PPM that I tried hard to decorate with results not as nice as yours. Good work, nice blog. Thank you so much for your kind words. 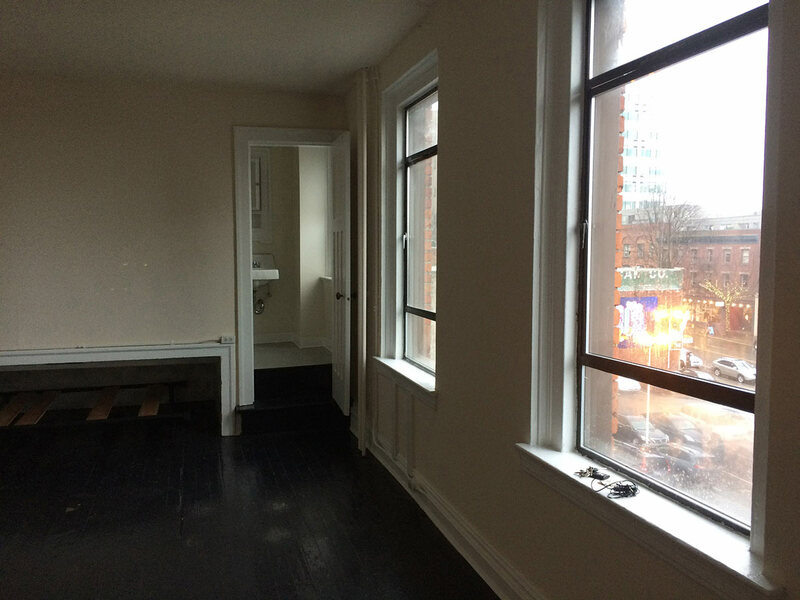 Living in the Rivoli has been a big transition for me, but I’m loving the experience of living in the heart of a big city! Stumbled across your blog on Pinterest while searching for diy drawer dividers. Since I was already here I thought I’d snoop around a bit. 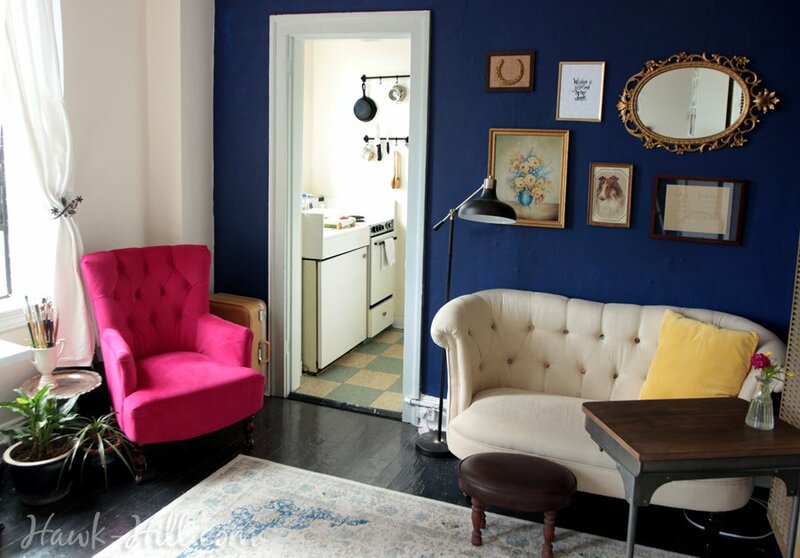 Your apartment is lovely!!! Your design style is perfection. I love your blog! I have spent half the morning reading your articles. You have given me so many ideas and much inspiration. I especially like the bar stool table. I think I would add wood to the 2 sets of rungs to create 4 shelves, 2 on each side, for even more storage. Thank you for sharing your talent and ideas.